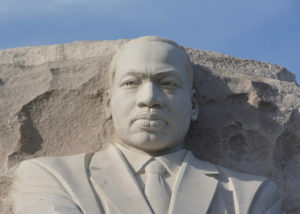 The Martin Luther King Jr. Memorial in Washington D.C.
Stereotypes can sometimes have some basis in reality, but it doesn’t mean they tell the whole story. More importantly, if that stereotype is all you believe about another group it fuels racism, xenophobia and prejudice. For example: “all the Muslims own all the grocery stores and gas stations,” “Indians own all the jewelry stores,” “Asians own all the nail salons,” “male Frenchies are all fishermen,” “white mainlanders aren’t invested in the islands and take all the high-paying jobs,” and so on – well, that’s what the community keeps saying at least, but really it is just another stereotype that people are spreading in the Virgin Islands. Racism is just a “word” that people come to understand as just how society isolates and separates people to be in “labelled” groups. Failing to understand the complexity of the term, the true meaning of the term, is visibly obvious and ignored at the same time. And yet it cannot be defined by just one meaning, as it can be seen as having several sub-definitions. Racism is out there, and it is hurting people and defining society, by means other than social status. Racism is indeed important to point out, as is pointing out the obvious ignorance of, not just people, but society and how it is learned to be in our everyday lives. It affects us all one way or another. The Virgin Islands is known to be a safe place that everyone can call “home” and feel secure. Such a statement alone can be considered as a “label.” We are in the beginning of a new year; 2019 and somehow racism not only still occurs, but is somehow getting worse and spreading. “It is nonsense. Blood is thicker than water, it doesn’t matter if you black, white, brown, or whatever, when you cut one of us, we all bleed the same color” said a Virgin Islander who has lived in the Virgin Islands 25 years. For some people, it does not matter what you accomplished in life, or how successful you are, the first thing they will observe is your obvious remarkable physical characteristics/features; whether it is your skin color, the hijab or a kippa on your head, the vermillion mark on your forehead, where one’s family comes from, etc. Because of the stubbornness of directly or indirectly racially profiling and how it is viewed, people around the world fail to realize, there indeed are individuals with parents of mixed cultures, traditions, and races. Racism affects us all, whether within ourselves (personally), amongst ourselves (peers), or even throughout the community events (at work or social events). “While pursuing my master’s degree at one of the top 20 business schools in the country, most of the assignments were group projects. I was the only black student in most of my classes. The students would quickly form groups so that myself and the Latin American students would always be left out and therefore have to work in a group” said another individual, who was born and raised in the Virgin Islands, moved to the states to complete their education, and now lives in the Virgin Islands. There have been several people on the island, who get cursed and yelled at for doing their job, yet when someone else, of higher and meaningful status, demands the same request, that very same job requested of the alternative individual is done with respect. “I asked a gentleman to move his car from a business parking, a business in which he was not going into, and out of nowhere he began to yell at me, but when the owner came and asked him to do the same exact thing I asked him to do in the first place, he moved it with no questions asked. It may or may not have been because of my skin color, but what else was I supposed to think when that was the only difference between me and this other person” said a security officer living in the Virgin Islands, who has experienced countless racist remarks. This same security officer, also works as a marshal, protecting the island in many ways, a marshal who helps keep the island safe. In this example, racism may have been due to skin color, social status, age of individual. Racism comes in several forms. Whether seen obviously or vaguely scented, it’s there, whether people mean what they say or not with what they say and how they say it. “After September 11, going to airports was never the same. I am always getting looked at and checked during security. I get it though, better safe than sorry. I always cooperate and show respect regardless. I let them know that I understand they have to check me for safety purposes. However, it doesn’t change the fact that people are still watching me like I did something wrong. Or the fear in their eyes when I am on their plane” said an individual born and raised in the Virgin Islands. People need to use common sense. Do you really think anyone wants to get on that very same plane with whatever you are looking for? Wearing a hijab was not only “labelled” at the airport for security check-ups, but it has become seen today as being racially profiled and, even further, as part of the definition to the term “terrorist” for how often it is used around Muslims specifically, for religious purposes, wearing turbans or scarves. One can question why both nuns and Muslim women cover their bodies from head to toe, but one is still oppressed. The concept of hijab is presented in every religion, and yet one is directly targeted to be viewed as “bad.” When will people learn to love and respect one another? Many individuals are so overwhelmed with all the terrible experiences they have had that they are just letting people disrespect them. “Let it get out there, because the only way to fix something is to bring it out in the open” said a Virgin Islander. “Can’t we all just please get along. In all honesty, if we were to humble ourselves, we can learn from each other. Help one another rise and succeed in life” said another Virgin Islander. Racism has become a term so broad to define that it has become big enough to even include the coverage of various cultural individuals, social status and even geography. It impacts the world in a negative way more than a positive way. And if we can just turn that around, and have more positivity than the negative, a difference will be made for the better. “As my local bredrin dem say, ‘Love alone will change the world, the respect will follow blindly. Bless and give tanks always.’ As Pressure Buss Pipe would say, ‘My people be free cause the world is yours and take control of your life of course … knowledge is the key … Let’s live as one…’” said a Virgin Islander born and raised on St. Thomas. We are not born with racism and prejudice: it is something that we learn as we grow. Social media, such as the TV news, Facebook, Instagram, Twitter and others all have an effect on the way we perceive things like racism. Our parents, our family, our peers, our community, our society, and even our educators all effect how we are raised to understand and interpret “racism,” and physically be able to live on a day-to-day basis around learning love hate or love. On a side note, some of you may wonder why I did not add the ethnicity of each quote that was given to me. But did I need to? I am sure you guessed all or most the ethnicity and or backgrounds of the individuals right, just by what the individual was saying. Nour Suid was born and raised in the Virgin Islands. She recently graduated with a doctorate in clinical psychology and is working on a doctorate in naturopathic medicine. She works locally as a therapist with individuals of all ages to help those with mental illness.